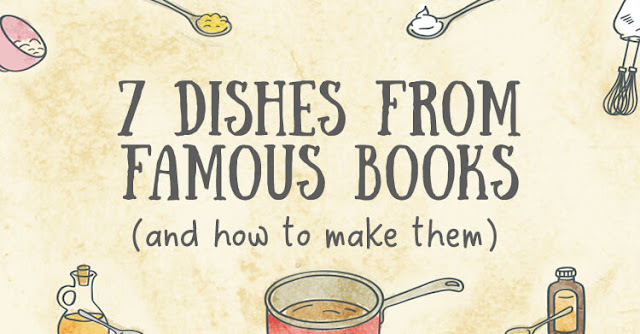 7 Dishes From Famous Books (And How to Make Them) #infographics ~ Visualistan '+g+"
A good novel can transport us to other worlds – ones where there are fantastic characters, vivid landscapes and often some delicious-sounding food and drinks. Do you dream of enjoying a beer in Hogsmeade or fizzy green pop in Giant Country? Maybe you long to set out on an adventure with Bilbo Baggins, with some tasty treats along the way. Or maybe you simply desire a cozy piece of cake with Miss Temple. Well you’re in luck, because these recipes can make your literature food fantasies come to life.